I am admittedly pretty behind on posts. While it seems as though not much has been going on, it's quite the opposite. I have made quite a few new things, but just haven't had the opportunity or time to post about them. A while back, Jason had made a ribeye bresaola that I had the opportunity to taste and was pretty surprised by the flavor and texture. 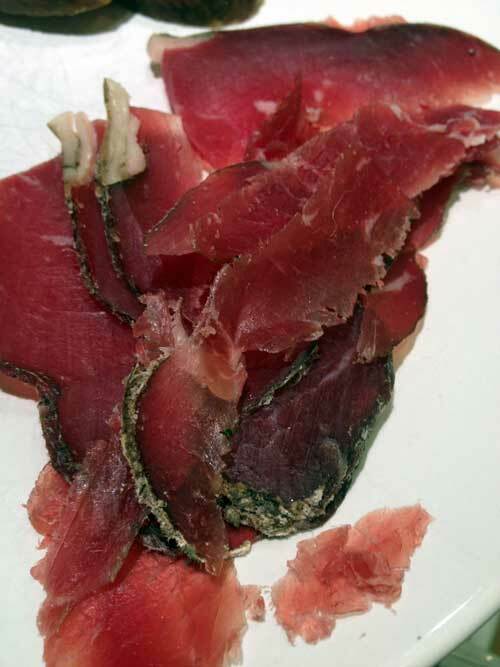 The fat was still tasty and palatable, and the flavor was much more rich then the typical bresaola. Encouraged by that experiment, I decided to try my own. We had a nice rib roast from a local farm of grass fed and finished beef and after boning that out, I followed Jason's recipe to a "T". After about 4 - 5 weeks in the chamber, I removed and tasted the product. It was great! The flavor of the beef was intensified, as you might expect. The fat was, in my opinion, even better than when cooked. There was a purity to the fat and it was more floral than I had expected. Overall, this was a great success, however I'm not sure how many times I'll be making it as it's a pretty expensive project. If it wasn't for our farming connections, I don't know that I would have even tried it in the first place.